A great tale of rowing on the Merrimack in Massachusets is at Duckworks Magazine this week, told by Josh Withe. In the first, he goes upstream in winter, circling an island and taking the nine knot ebb tide on the way back, to be caught in a snowstorm: "Within seconds I was rowing in the center of a snow globe, the only sound was the steady creak of the oar locks and the splash and drip from the blades." 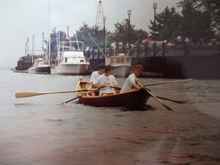 In the second, he rows with his sister downstream towards the river mouth with another boat (pictured) and gets caught when the wind gets up. He tows the boat back through the shallow water.